Persian Caravanserai is part of the Tentative list of Iran in order to qualify for inclusion in the World Heritage List. I visited many caravanserai in Iran. Some of them are new, basically pit stops for gas, food and repair your car, they often call them service station now though as you may expect. Some of the classic caravanserai are now guest houses or coffee shops. The classic ones are supposed to be for when the silk road camel “caravans” were passing through Persia and needed a place to rest and refresh. If you look on the map you can make out a line going west <> east. There are some caravanserai not included in this inscription request, most notably the one next to Cyrus' tomb, but an easy “tick” would be to see the one in Bisotun which is a one of those coffee houses now. I spent some time finding the ruined ones along the road but sometimes they are not easy to find, perhaps the road doesn't allow you to venture into the area next to the highway, it would be silly to go off-road with a sedan, but sometimes the ruins are just there in plain sight, unprotected unfortunately. Taking Khaneh Khowrdeh as an example (romanization may vary) one can just take a road off the highway and you park right in front of it. There is no tourist sign, only a sign for what I believe is deterring vandalism. Graffiti is rife in and outside the walls. Gone are the camels and the new visitors, baaaaaaaaa, leave so much poo that it's not easy to venture inside. This caravanserai still holds up pretty well though. You can see all the separate rooms prepares for guests with a large courtyard as central point. I think this was still the best one that is not in total ruins and not modernized as a guest house. These buildings need better protection, at least a fence around it. 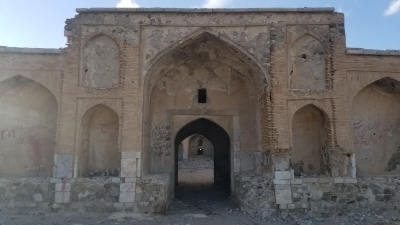 The Persian Caravanserai were only placed on the T List in Feb 2017 as part of a "mini update" which added a further 10 sites to Iran’s already enormous T List (currently 55)! Whether this implies imminent action to try for Nomination isn’t clear, but some of the locations are pretty easy to pick up whilst seeing existing Iranian WHS if travellers want to avoid missing out on a "future inscription"! Assuming that is, that they survive any future "cut", since a slight problem is that the UNESCO site states that “in this file, there are 25 Caravanserais, from all over Iran under the name of Persian Caravanserais which are selected from hundreds of Caravanserais.” - and then lists what appears to be 32 locations!! I have just discovered and added coordinates to our T List map for 24 of them, augmenting the 3 identified when the site was placed on the T List – so 5 remain to be identified – “possibly”!! Iran’s main highways are really very good – enormous “Dual carriageways” (UK English) or “Divided Highways” (US!). As you zip along, you will pass many, many Caravanserai. A fair number will be in ruins but others are operating as Hotels/Restaurants. I would recommend stopping to explore at least 1 ruined one – even if it isn’t among those on the T List. It is interesting to note just how many along the highway have a modern Gas station /Restaurant located very close to them – in that way the traditional places of rest along historic trade routes are carried forward to modern highways. 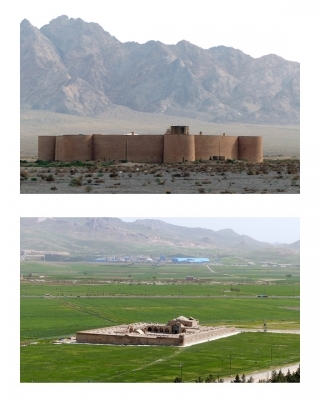 The concept of a “Caravanserai” goes back to the earliest days of Persian civilisation – the Achaemenids, c2500 ybp - but the main periods of growth were the 10th through to the 16th C. Shah Abbas in particular insisted on their creation across his realm at distances of 1 day’s travel apart (by Camel presumably!!). I don’t know which of those included in the list of 25/32 contain the oldest examples of architecture – certainly designs from the period of Shah Abbas seem to be the most common. This web site contains a nice list of around 900 Caravanserai and also explains the various designs and architectural features as well as "majoring" on a few selected examples. As far as I can see, we only "consciously" visited the Caravanserai at Bisotun and Zein-o-din during our 2016 tour of Iran (though we will also have seen, and maybe have stopped at, a number more along the Sabzevar - Semnan - Mashad road which seems to contain a significant proportion of the proposed Caravanserai - probably because it was/is both a trade and major pilgrimage route). I have created a composite photo of those 2. Zein-o-din (top) features as an overnight for many group tours- you will pass right by it if you travel between Kerman and Yazd. I didn’t take to its commercialisation and wouldn’t want to stay in the somewhat cramped tent-like structures which have been put in place to provide a degree of privacy whilst increasing the number of persons who could be accommodated without the original rooms being open “dormitories”. You can go in and have a look if you are not staying - but only if you pay an entry fee (which also gets you a cup of tea!) The second photo is of Bisotun, which is easy to visit whilst at that WHS (and is actually already inscribed as part of it) but nowadays lacks the true "desert" location unfortunately. Another Caravanserai which has received comments/reviews in guide books and on the Web is that of Sa'adol Saltane in Qazvin -which you will pass through if travelling between Tehran and Soltanieh/Tabriz. I remember it primarily as a town centre “bazaar”- attractive but also heavily restored for tourists. But I may have missed something. In any case, it totally lacks the atmosphere of a Caravanserai located in a “remote” desert location! If Iran does push ahead with nomination it will be interesting to see whether it can do so in advance of Turkey which also has a series of Caravanserais on its T List. I can’t imagine a coordinated nomination - just as there are numerous European WHS for different cathedrals, churches, villages and vineyards, Iran and Turkey would no doubt find plenty of reasons to differentiate and trumpet the values of their own examples of these structures!